(NaturalNews) This morning, President elect Donald Trump announced his pick for Secretary of Health and Human Services: Rep. Tom Price, a Republican from Georgia. 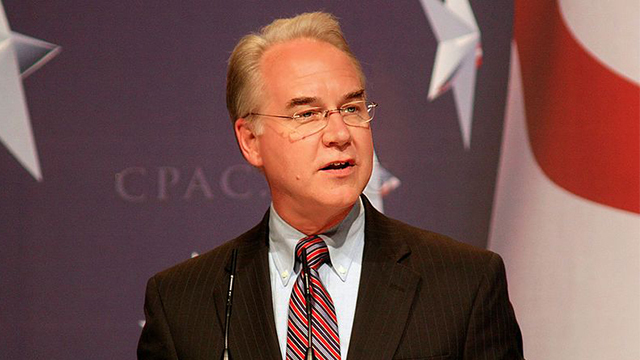 Before serving in Congress, Price was an orthopedic surgeon, and he's well known for being a strong, vocal critic of the Obamacare fiasco (Affordable Care Act). "He is exceptionally qualified to shepherd our commitment to repeal and replace Obamacare and bring affordable and accessible healthcare to every American," announced Donald Trump. Sadly, Tom Price is also among the many Republicans who voted for the so-called "DARK Act," a bill that outlawed state-level mandatory GMO labeling laws like the one passed in Vermont. Mike Pompeo, a Republican from Kansas, also voted for the DARK Act, and he has already been appointed by Donald Trump to head the CIA. A vote in favor of the DARK Act means a vote against consumer transparency about what they're buying and eating in their food. It's a red flag against both Tom Price and Mike Pompeo, as it indicates they have both functioned as part of the "Monsanto establishment" that has long sought to keep people in the dark while feeding them unlabeled GMOs. The question on everyone's mind is: Will these two individuals now represent the People, or are they still bought off by Monsanto? What's my take on this? We all know that Monsanto has infiltrated every establishment and political party in America. It's almost impossible to find anyone in a position of regulatory or legislative authority who hasn't already been influenced, threatened or bought out by the deeply corrupt biotech industry. The overreach of corporatism in America is systemic and insidious. But there is a strong anti-establishment movement gaining steam in America and around the world. The election of Donald Trump is proof that the establishment as it has long been known is being rejected by voters. Under the leadership of Trump, many legislators, officials and cabinet members may now realize they have permission to challenge the status quo in their own realms of government authority. If that happens, we might see people like Price and Pompeo exhibit a new level of responsibility in rejecting the corruption of the old system from which they emerged. Or, on the flipside, we might see the opposite happen and watch in horror as the establishment swallows Donald Trump like a prehistoric tar pit, delivering nothing but the same old corruption and corporate collusion that typified the Hillary Clinton campaign. Only time will tell, but I assure Natural News readers that we are watching carefully, and we will hold everyone in the Trump administration accountable for their actions. If they don't reject the corrupt status quo and start representing the interests of real Americans, they're going to be called out and rejected at the next election opportunity. The same goes for Trump. Nobody gets a free pass. Everyone is held accountable. But let's not pre-judge them at this point. Trump hasn't even been sworn in as President yet. The real test will be what unfolds after January 20, 2017. Only then will we know for sure what we've voted into power in Washington. To keep it all in perspective, in my view there's almost nothing the Trump administration can do that would be worse than a President Clinton. But we didn't elect him to be the lesser of two evils... we elected him to Make America Great Again. And that's what we demand of his administration. Tom Price can start by repealing Obamacare. That's incredibly important for all small businesses across America. From there, we're going to keep pushing Tom Price and Donald Trump to achieve important reforms for health care across America, including legalizing natural medicine, ending the Big Pharma market monopolies and labeling all GMOs. How much we get of that is anyone's guess. My honest opinion is that nothing big changes until the current system collapses. In my assessment, Donald Trump will be the last President of a 50-state United States of America. The financial collapse that's coming in 2017 will change everything, rendering many current government policies on health care and GMOs completely irrelevant. Stay tuned to Natural News to see what happens... (and thank God we didn't end up with Hillary Clinton in the White House, as she was the "Bride of Frankenfood" who worked very closely with Monsanto and could be bought off with corporate money). Who voted for the DARK Act to outlaw GMO labeling? Sanford D. Bishop Jr., D-Ga.
Charles W. Boustany Jr., R-La. William "Lacy" Clay Jr., D-Mo. Henry "Hank" Johnson Jr., D-Ga.
Joseph P. Kennedy III, D-Mass.